As a medical practice in the modern world, your website is your representative. Current patients may visit for reasons such as contact information, business hours, and the latest blog posts. Potential patients will likely visit your site to find out who you the physicians are, what the reviews are like, what conditions are treated and what insurance is accepted. If you want visitors to stick around on your website, you need to give them a reason to do so. That means providing them with interesting and helpful information that will keep their attention. Articles, videos and slideshows are great ways to keep people engaged and keep them on the page! Are you a chiropractor? Post content around topics such as what conditions chiropractic therapy can help, how it actually works (facts and myths), and a bit about yourself! Do you run clinical trials? Write a piece for each condition you study: what the condition is, who your ideal volunteer would be, and what can be expected of participating. 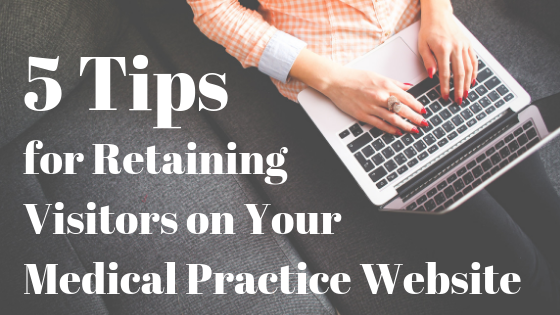 Regardless of your field or specialty, every medical practice can benefit from a blog. It doesn’t need to be daily and it doesn’t need to be award-winning writing. Post content that shows what matters to you as a practice: who works there, what conditions you are treating, what type of care you excel at, and how wonderful your patients are. Additionally, make sure that content is easy to read or watch. Internet users have incredibly short attention spans, so you really want to make the time you have with them count. As soon as they get bored, they’ll be onto the next thing. Here are some tips on “snackable” content: stick with short sentences, break up content into shorter paragraphs, keep videos brief, and utilize bulleted lists! When you have eyes on your page, you want to seize the opportunity! The truth of it is sometimes people just don’t want to read. And that’s fine! Marketing is moving in the direction of video – and so should you. Video is not as intimidating as it may seem at first! You don’t need Hollywood-level budgets or productions to get your point across and pull in an audience. Medical practices already have everything they need for awesome video content! Current patients know your business, potential new patients are never in short supply and there is always some kind of action happening. Video is one of the most rewarded (and rewarding!) mediums out there in the digital marketing landscape. Don’t get left out! Again, people browsing the internet tend to have short attention spans. A surefire way to lose visitors is a slow, lumbering load time for any page. People get bored, lose interest, get annoyed and they’re off to another site – maybe a competitor’s. Need help with you website? Contact us here!